This week I managed to get my Tula Pink quilt basted, quilted and bound. Yipee. This quilt has been a work in process since May last year…I would do a few blocks here and there when the mood took me, till I had 30 blocks ready to go. I actually got the quilt top finished during the snow storm a few weeks ago but it took me another couple of weeks to get her basted and then quilted. I am beginning to notice that I am not as fast to baste and quilt as I am to piece. Okay I admit it I love to piece quilt tops…quilt them, not so much. Anyway I soldiered through and this was the result…. I love the blocks and that Tula Pink City Sampler blocks are a great project to dip in and out of. 2. It highlights that my quilting may not be completely straight. It was a huge learning experience for me and I think the quilt still looks cute, despite my missteps. It is backed with some lovely Lotta Jansdotter fabric from her “Echo” line. And hand bound with two different Kona cotton pinks… scraps I had left over from another project. I am definitely making a blue version of this quilt so I can do more blocks from the book and so I can slip in the Tardis block. I will take what I learnt from this quilt and apply it wisely. It’s lovely. I like how you’ve stuck to pinks. I’ve seen Tula’s quilt in the book, but think I prefer a single colour scheme like you’ve used. I liked the challenge of keeping within a colour scheme with these blocks. I tried not to duplicate the fabric too much. Lovely finish! I think the quilting looks fine, wonky lines are totally in right now ;-). The back and binding are a perfect match for the quilt! I love the idea of wonky lines being in fashion. Renee usurped my line; I was going to say something rather similar. The quilt looks very good. I love your quilting! I think the grid is awesome! There are going to be more grids in my quilting future…I like them and I need the practice! I love your quilt. All those pretty shades of pink. The straight line quilting looks great. I think of each of my quilts as an experiment in something. Its mainly colour for me. I am looking forward to seeing your blue version. I am two blocks in to the blue one…so you may have to wait awhile before it starts coming together. Yep 100 blocks was too much of a committment for me! I love this quilt so much! I don’t think that the quilting thread choice detracts, at all. It’s gorgeous! Absolutely. I did not know there was a Tuesday Tula Link up…what fun. there wasn’t- it’s something brand new I’m trying this week 🙂 So many folks out there are making such great blocks- I thought it would be fun to come together and share our progress. I hope you’ll come by! You just had to go and point out the wonky stitching that none of us would have noticed otherwise… I like the fact that the quilting pops out a little, and I don’t think it distracts from the blocks. NOTHING could distract from those blocks. 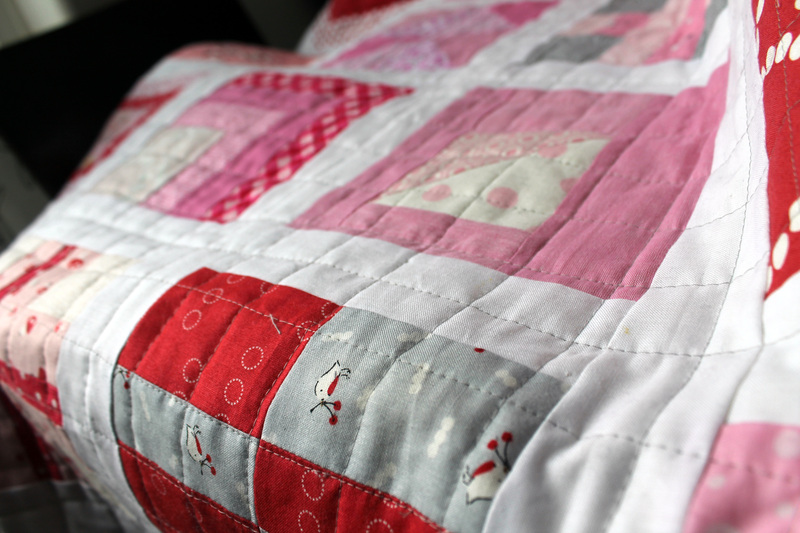 A gorgeous little girl’s quilt. It’s gorgeous! Lovely work! I know what you mean about the quilting and the basting. I feel the same way. 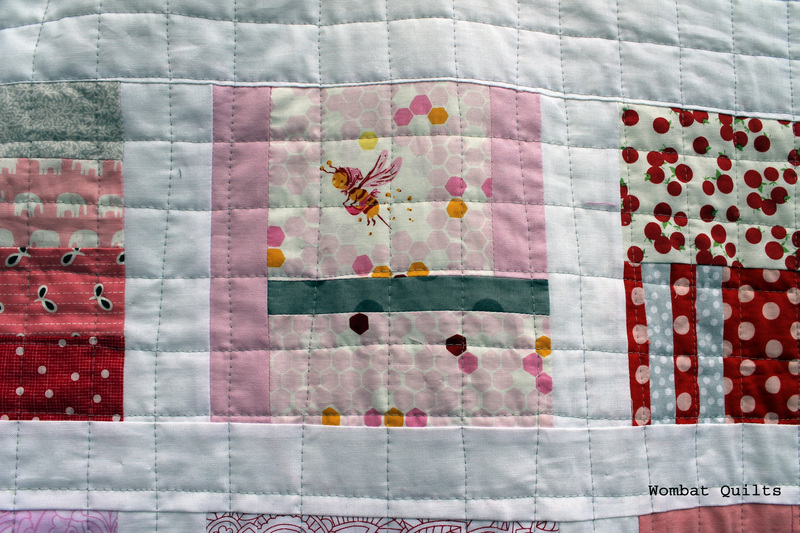 I think the wonky quilt lines – which I didn’t notice until you pointed them out – actually add charm to this. I wouldn’t worry about them at all. I think the grey thread adds another modern element to such a beautiful quilt. Well done!!!! It’s absolutely fabulous!! 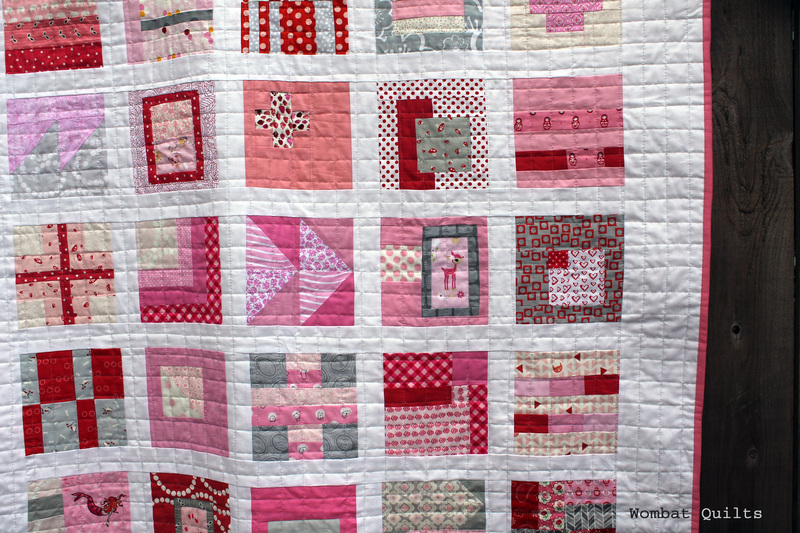 Love love the colors … I kinda like the grey quilting threads! We would not have spotted the wonky lines if you had not told us. Like you, I prefer fabric stash raiding and piecing to quilting. I quite like binding as it means I am almost finished. jaw-dropping as usual! ❤ the loves! oh I think this is just perfect! Personally I love the gray! Awesome quilt – it is different that other ones using the same pattern – but I think I like it better! You’ve inspired me! 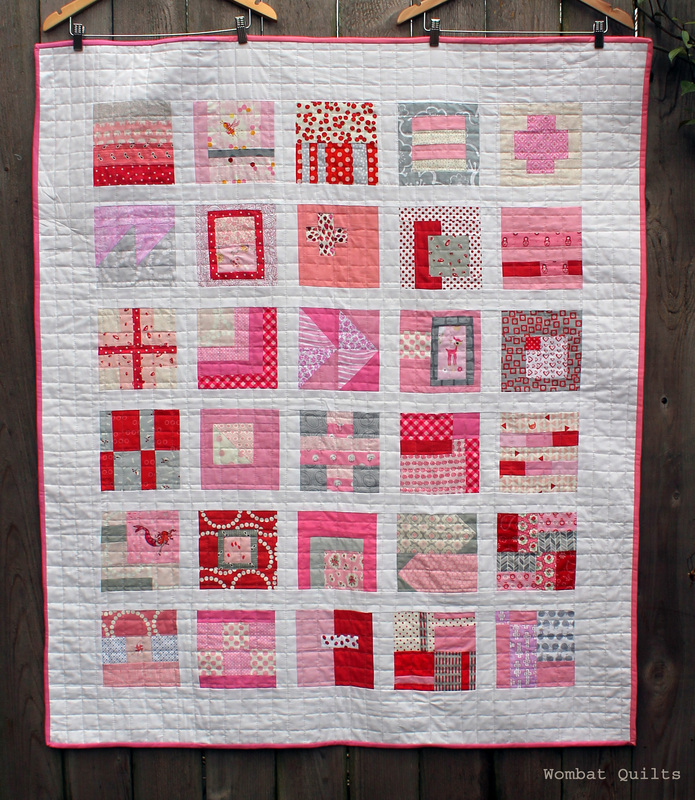 fabulous quilt – love the backing and the use of two different pinks for the binding too – inspired !! I love it! And that’s called ‘organic’ quilting. 😀 Would love to do this. List getting longer. 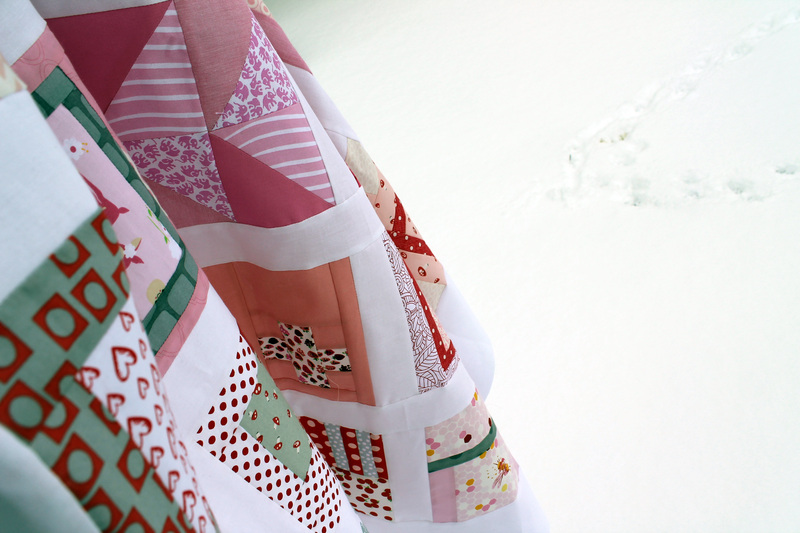 Really lovely quilt ~ love the fabrics you used too. The quilting is perfect! A Tardis block? Photo please ~ I LOVE Dr. Who! I love this so much, it’s not even funny! Beautiful! OK, I absolutely agree this is a nice quilt. 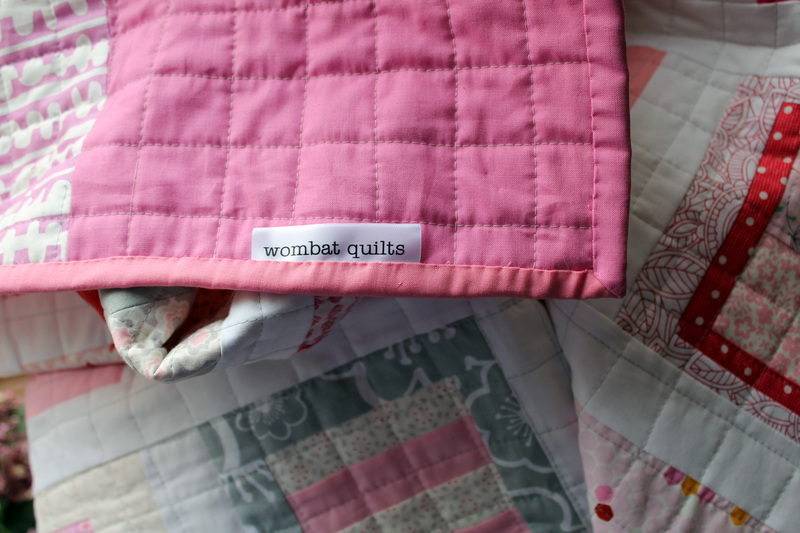 But I really want to know about the cute little Wombat Quilts label–I need something similar for my quilts! Blog about your search for labels and where you got it? I enjoy your blog. It looks great, I love the limited colour palette. So lovely, I love pink. So beautiful! I love the pinks as well, just a lovely palette. It’s very juicy and pretty! I love your block color choices. 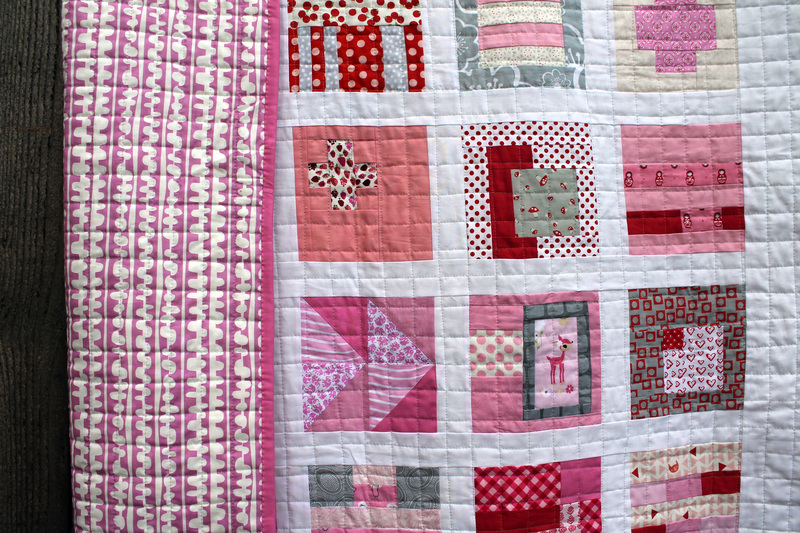 How genius… a PINK Tula Pink quilt!! 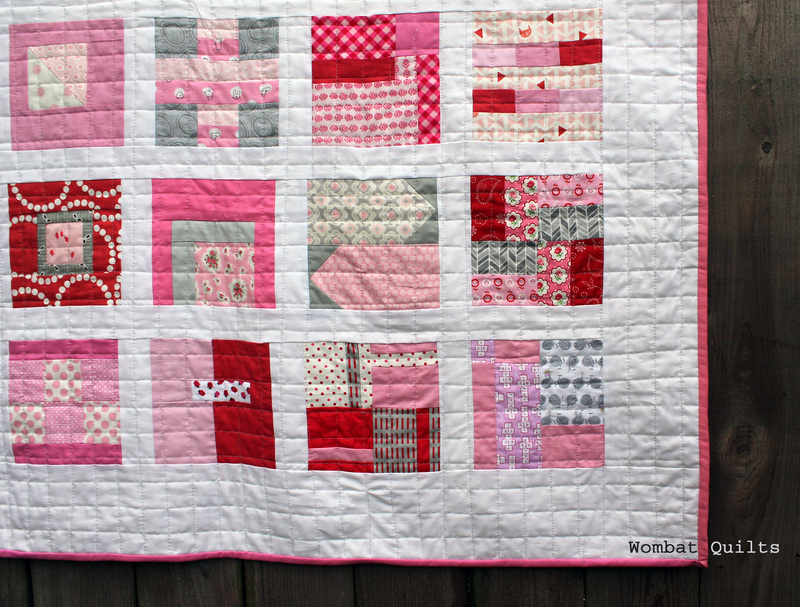 I adore your fabric choices, and agree that the quilting detracts a bit from the fun blocks, but it’s still awesome! The dozen blocks I made from the book followed the colors shown there, but this is much more appealing to me. Thanks for sharing! !